Occasionally I join in on a Recipe Swap on a cooking board I'm on, and when I was assigned A Taste of Home Cooking, I pretty much immediately said "Yes, now I have zero excuse to ignore the Philly Sloppy Joes". I regret not making these sooner; you know, like 2 years ago when I first saw them! And remember when I said that I stick to my regular sloppy joes? Well, these may be my new regular! I personally liked these a lot more than "normal", and they were easier! Almost as easy as opening a can! Next time I make them I'd love to try them with the cheese sauce, but this time I wasn't thinking! In a large skillet over medium-high heat, add the oil. Add the onion and green peppers if using, and cook until soft and starting to brown. Add the ground beef and cook about 5-6 minutes, draining off the fat when finished. Stir in the steak sauce and beef stock. Season with salt & pepper, bring to a boil and cook about 2 minutes. 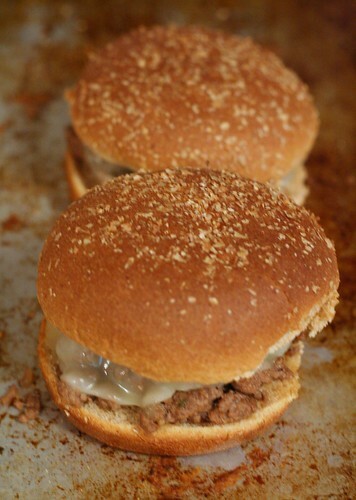 To serve - place a scoopful of the meat onto the bottom of the rolls or buns. Top with cheese and/or whatever condiments you prefer, and top of bun. Melt the butter in a medium pot over medium-high heat. Stir in the flour and cook about 1 minute. Whisk in the milk, bring to a boil and let thicken for about 2 minutes. Turn off heat and stir in cheese. I love these sandwiches! Great pick!